I do like to be beside the seaside. One of my favourite places to be beside the sea is Santa Monica. I arrived on a Saturday afternoon and checked into my motel before walking down to the ocean front. I didn’t actually go onto the beach this time, but I stood up on the bluffs and sketched a panorama of the view looking toward the famous Santa Monica pier. It sure was windy. The sun was shining bright, so I stood beneath a palm tree and did my best. People walked by snapping pictures of them self (if only there was a word for that sort of thing), speaking in all sorts of languages. Behind me, the city of Santa Monica bustled. It was a busy Saturday. I drew a cannon, as you can see. This big cannon sits up on the cliffs, it actually reminded me of Mr. Nosey, of Mr. Men fame. He was green of course but had the same general shape (in the old version, not in the newer upturned nose version, I really hate that version, it’s my Jar-Jar). As I sketched, people climbed on to have photos taken of themselves with a big cannon between their legs, if only there was a word for that sort of thing. After this, I had to go and watch Avengers Age of Ultron at probably the most comfortable movie theatre I’ve ever been to, the AMC in downtown Santa Monica. Massive reclining seats!!! I want to see every movie there. 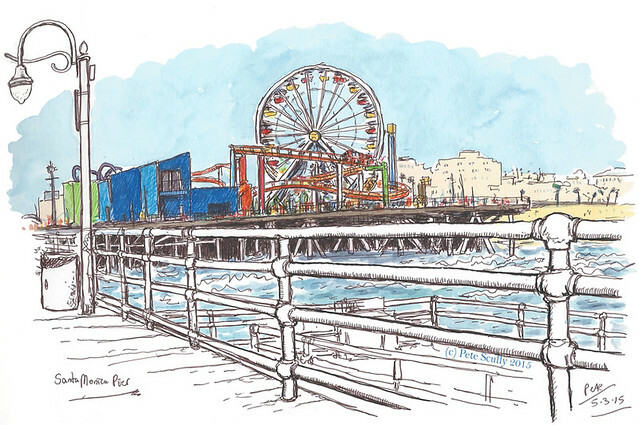 I did come back down to the Santa Monica pier again the next day for some last minute sketching, and I met up with my fellow Urban Sketcher and Santa Monica local Shiho Nakaza. I first met Shiho at the 1st Urban Sketching Symposium in Portland back in 2010, and she introduced me to that amazing brown-black uni-ball signo UM-151 pen that I now use all the time. You can follow her sketches at shihonakaza.blogspot.com. We didn’t have long to sketch, so we went out onto the pier and sketched the view. The waves were wild in the Pacific, and the sun was bright and strong. I had to finish up quickly though because I had to catch a bus back to the motel, and then to the airport (I only just made my plane!). I still have more sketches to post though, from (spoiler alert) Santa Monica’s historic Main Street, and from Venice’s Abbot Kinney Boulevard. Although I prefer beaches without people and with colder weather, your illustration proves that you are a great artist able to capture the immediate atmosphere of public places. Do you know the work of Australian artist Tom Carment? Something of your style reminds me of his work – very nice! Wonderful drawings as always. 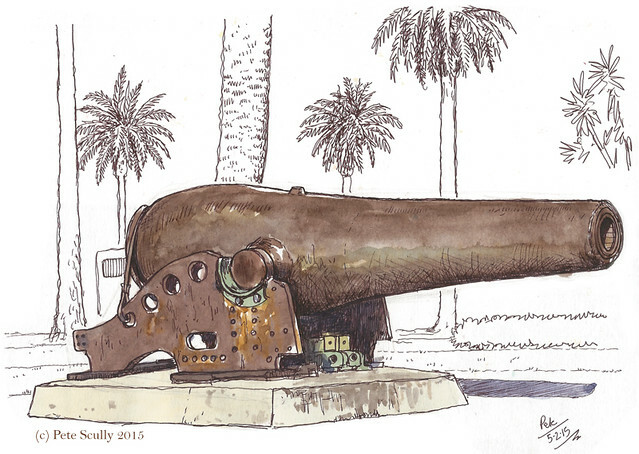 I think it’s rather impossible to walk past a cannon and not go nuts (boom boom) with the phallic symbolism of it. I remember one time at Stirling Castle I noted that every single cannon on the ramparts had somebody straddling it. I love the colour and texture of the cannon’s metal that you’ve achieved. Thanks for posting these! I used to live in Venice and ride up the bike path into Santa Monica about once a week. The sketches bring back a lot of happy memories. Looking forward to seeing your Abbot Kinney sketches too. I love your drawings and your sketchy style. It helps me picture how the city is like. After living in Canada for so long I really miss going to beaches. So seeing this post makes me feel a bit nostalgic. It brings back a lot of good memories from travelling and going on vacations during my childhood.